​Deans Marine Open Weekend 8/9/10th. We will be displaying at Ron's yearly open workshop and exhibition to the public. Don't forget the Keith Carey Memorial Shield on Sunday 17th. Sailing starts at 9:30am and voting for your favourite model boat in the clubs begins at 11am. ​Prepare for the first evening sails of the year! The last Friday of each month will be our monthly evening/night sail, bring a boat with lights on and enjoy the bacon butties and the burgers. May-Model Boat Mayhem is coming soon so make sure its in your calendar. We will need volunteers to erect the gazebos and man the tombola stand. June- Wicksteed at War Weekend. Bring a boat to the exhibition tent, if you've got a warship- even better! Doncaster Model Boat Show- CADMA see upcoming shows page for further details. ​AGM 6th March- Its that time of year again to renew your membership and hear about the club's activities over the last 12 months. If you can't make it please contact Alan the secretary via his email and he will ensure that you get your renewal. Please remember that the first weekend in April will be the Coalville Model Boat Show, and the following weekend the club will be displaying at Model Ex'17 in Raunds Windmill Ave Primary School. We have 35 boats booked in already, contact Alan if you wish to have a boat entered. Model Ex'17, this is a very popular event held every second year, in 2015 we exhibited many models- enough to fill a classroom! We hope to be able to exhibit as many, if not more, this time around. Please contact Alan before Feb 24th to book in your models with the model names, type, size, and approx value. Model Boat Mayhem at Wicksteed 2017- Whitsun Bank Holiday Weekend (May 27/28), last year we were unable to provide a Tombola and we received feedback that it was sorely missed. If anyone can help set up, and help run the Tombola stall for this year please contact Nigel Marriott. Donations towards the Tombola will also be gratefully received. Happy New Year everyone! Important information for the next couple of months particularly in March: Saturday 4th March Club morning sailing meet instead of Sunday morning as the park is hosting a Scooter Rally and access to the lake will be difficult that day. Monday 6th March will be the club's Annual General Meeting held at the Stirrup Cup starting at 7:30pm. Sat/Sun 1st and 2nd April 2017 Coalville Model Boat Show, Sat/Sun 8th and 9th April 2017 Model Ex'17 at Raunds Windmill Ave Primary School, Sat/Sun 22nd and 23rd April 2017 Spalding Model Engineering and Hobby Show, and Sat/Sun 27th and 28th May 2017 Model Boat Mayhem at Wicksteed 2017. Keep an eye on your emails for up to date information from Alan. Christmas Dinner Time! Monday 12th December 7pm for 7:30pm serving. Time to find out the winners of the Keith Carey and Maureen Millers Memorial Cups and Shields, as always presented by Maureen Carey and her daughter Kim, and Paul Millers. The club displayed at the biggest show we attend- The International Model Boat Show at Warwick Exhibition Centre, near Leamington Spa. A staggering display of WW1 warships, vintage model boats and everything in-between, won us 3rd place in the club stand competition. ​We have been invited to display once again next year. Ron Dean of Dean's Marine has invited the club to attend his Open Weekend over the 9,10,11th September at Farcet Fen near Peterborough. The club's annual competition for the Keith Carey Memorial Shield will be held on Sunday 19th September between 10am and 1pm. Come along with your best boat and vote for your favourite model boat in the club. 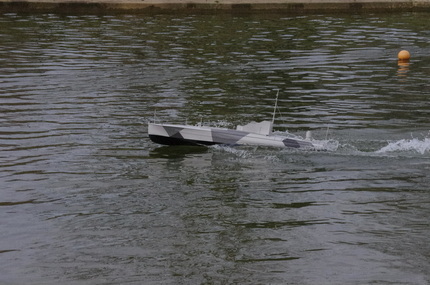 Alan has sent an email for inviting members to display their model boats at the International Model Boat Show at Warwick. This is a very prestigious show with lots of traders and clubs in attendance, and we have one of the larger stands to display our boats. If you would like to display your model boat(s) please contact Alan Burgess with your details of yourself and the model(s). Many thanks to the volunteers who helped replace the wood on the club's jetty at the lakeside, we now have a fantastic jetty that will last years to come. If you have a WW1 warship it would be most grateful if you could display in the Battle of Jutland Display. A reminder that if you need to renew your membership contact Alan Burgess either via email or send a SAE to his home address. Membership renewals is going well with 50 members already rejoined. Alan wishes to remind everyone that season ticket car parking prices will be increasing slightly this year, and don't forget to bring your car pass card with you when renewing your season ticket. The organising of the annual Model Boat Mayhem show is going well and the club gazebos will be in use for the club models once again. Its the 10th anniversary for this show so please show your support. Dates are Saturday 28th and Sunday 29th May with the setting up on the Friday before the weekend (Whitsun Bank Holiday weekend). The water quality is still extremely good, Nigel reports, despite the flood a couple of weekends previously as result of Storm Emily. We have been invited to return and display at the International Model Boat Show 2016 at Warwick, a sub-committee is being created once again to organise our stand. If you want to display your model please speak to Steve or Alan at one of the club nights or at the lake side. The website has changed editors, if you want to add/submit anything to the site please contact Nick Brown via his email address. Thanks to Derrick and Paul for running the site for the last three years but other commitments have prevented them from continuing in this role. After a year of mourning for two beloved members of the club's committee, Maureen Millers and Rob Mitchell, who were taken away from us, the members has came together to re-energise the club. 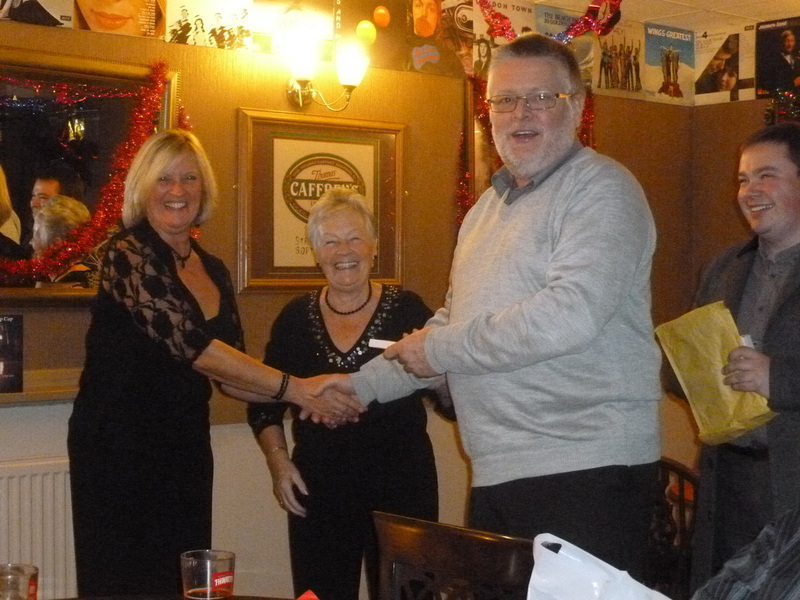 At the Christmas Dinner Steve Brown, the club Chairman, revealed a new memorial trophy presented and donated by Paul Millers for 'The Chairman's Favourite Model Boat'. This year's lucky recipient was Roger Clements, we hope to continue with this new trophy which will be presented at the Christmas Dinner with the Keith Carey Memorial Shield. THE LAKE or A TALE OF MODEL BOATERS. The final phase of water treatment was carried out on WED 13th AUGUST. To recap on what has gone before,it was decided to trial a product recommended by a member.This is designed for the treatment of algae and blanketweed,and consists of sugar like granules.This turned out to be very effective, dead algae remaining on the surface was removed by scoop. Another problem to be looked at was the large silt deposits that build up over varying periods of time and formed a base that promoted algae and weed growth. Another reason for removal was based on Wicksteed's plan to no longer drain the big lake, presenting the club with the problem of how to remove this silt. The company that produces the algae treatment also supplies a product that digests the organic matter in the silt,and this is what we used. As there was a large amount of silt present,this was removed prior to adding the base. To obtain a regular dispersion of of the base, sightings were made between objects on the bank (club members). The base did just what it said on the tin,and in next to no time the whole lake bottom took on an overall grey colour as the product spread all over, thus forming the growing medium for the bacteria which was applied next. The bacteria becomes active over three days, so watch this space. Hello everyone, Happy New Year, here are the Monday meeting dates for 2014 and please note CHANGE OF VENUE. As from the 13th January 2014, the Monday meetings will be held at the Stirrup Cup, Woodland Ave, Barton Seagrave, NN15 6QR. Those members who have been to the last couple of meetings have agreed to this change. More details and pictures are on the club website. The members who are not on e-mail have been sent this by post. Also, all those who would like club jackets, please let me know so that we have an idea of numbers. Price as yet is not known but is expected to be approx £20 and the colour will be a mid blue. The Keith Carey Memorial Shield 2013. 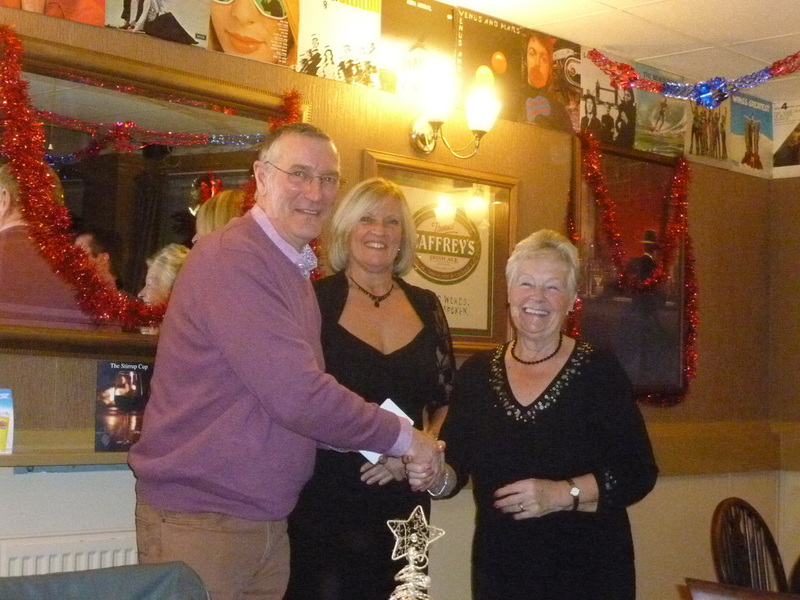 The Keith Carey Memorial Shield was presented to the 2013 Winner by Maureen Carey after the Christmas dinner at the Stirrup Cup pub in Barton Seagrave on Monday the 9th December. Maureen was accompanied by her daughter Kim who helped in the presentation and afterwards made a short but poignant speech that touched on her fathers committment to the club and the club and committee's efforts to honour his memory. The winner for 2013 was Nigel Marriott with Paul Millers second and Clive Beard third. The pictures below were taken with my compact camera that I thought had survived a fall onto a concrete floor but it seems that was not the case, but they are not too bad and if I can get hold of some others then I will replace them. Nigel receiving the Keith Carey Memorial Shield. 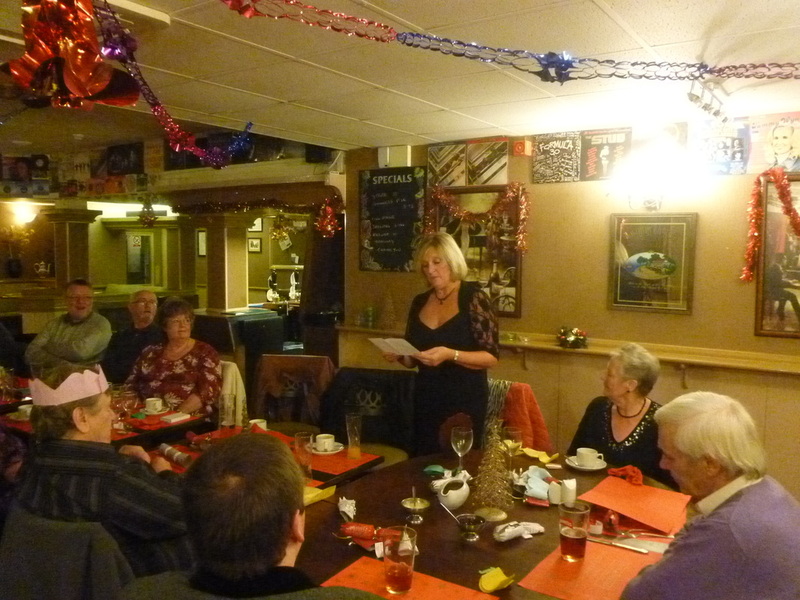 Kim making her speech after the dinner. Nigel's report on the lake and the surrounding works. The manufacturing arm of the club has produced a new tool for the removal of sludge. This was tried out on Saturday last and was very successful, well done to those concerned. There is still some silt requiring removal later. The company who supplies the algae treatment also do a treatment for silt that we intend to trial after the final dose of lake clear for the present. There are traces of the algae growing but only in small patches but is very flimsy and will present no problems as I can see. Unfortunately these two treatments cannot be used together, and the minimum temperature they can be applied is 12deg, the lake temp at present is 4deg. Below are a few pictures of the area surrounding our shelter and of the main lake at the back of the shelter. The last four are from Nick's Iphone hence the format. I recently spoke to the site manager, he tells me the main lake silt removal is going to plan, piling is in progress for the sluices which I understand will consist of inlet, outlet and balance sluices. Carpenters are due in next week and concrete pouring will start the week after. Those of you who have been to the lake recently may have noticed the clarity of the water and the reduction of weed/algae. This is due to a new treatment that was brought to my attention by a new club member via Maureen. The treatment involves scattering crystals over the surface of the lake and that's it. I have just run small local tests to see the effect on the algae, on the bottom of the lake, growing up from the bottom and floating on the surface. A large pinch of the crystals soon sank to the bottom and within about 10 sec the algae was rising to the surface and in a short time you could see what was in effect a bald patch on the lake bottom. Applying this to the growing strands caused it to float to the surface where the crystals can be applied. This kills the algae, turns it brown and it can be skimmed off. When i spoke to the suppliers they said if not removed it will sink and bio-degrade. I am at present investigating an effective way of dispersing the product over the surface. we have enough to treat an area twice the size of the lake but from the results the one major treatment will do the job with the rest to treat any pockets as they return. The company also produce a sludge buster for organic matter which I will look at when the treatment is finished. They told me to turn left or right when I came through the gate, did I go wrong somewhere? Sorry Nick but you knew that was coming! (and no it's not been photo-shopped)! Modelboatmayhem.co.uk at Wicksteed has been and gone, and for once the only water was what was in the lake! For photos of this years mayhem please click the link above. Also to see what all the fuss is about please visit modelboatmayhem. There is a huge wealth of knowledge on all things model boats on the website and on the forum, and best of all, it's all free! 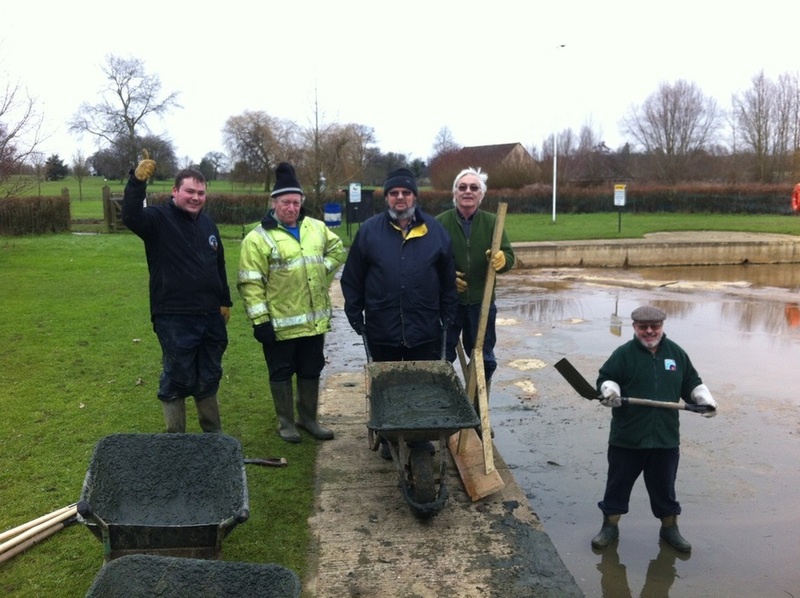 It's not fun, it's messy, it smells and it can be back breaking work, so this is a big thank you to all you members who helped clear the lake after all the winter flooding... Click the link below. 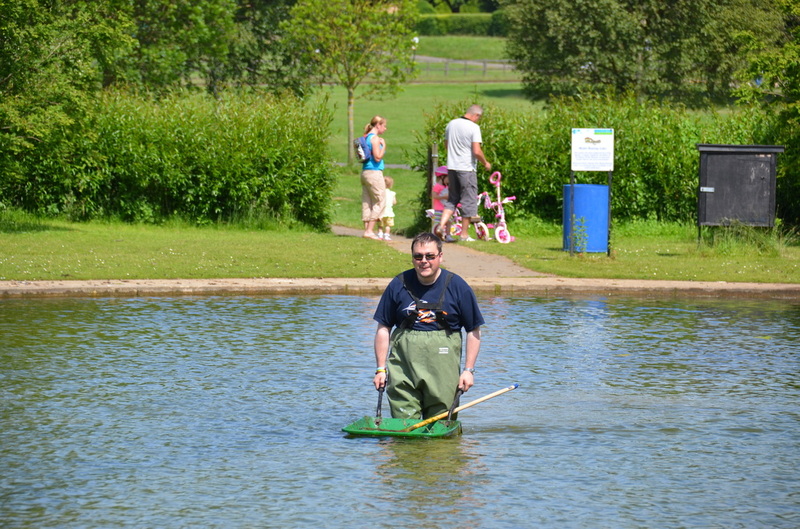 The lake is now cleaned, refilled and ready for use. While there's a chance we still might get heavy rain Nigel has left the side overflow bung out for the time being. Steves newly finished CMB, was one of the first models to test the new water. Happy new year to you all. Just a line on the state of the lake. After a back breaking day removing silt from the lake by Paul, Dennis, Richard, Steve, Nick and myself repaired to the cafe for coffee to decide our next move. It was decided to re-fit the overflow pipe to prevent water flowing in from the lake if it should it rain again. I went up on Sunday there was about six inches of water, I removed the pipe and started to sweep the silt toward the drain, it was amazing to see the silt dissapear down the hole. A couple of hours saw a large area of the bottom clear I finished by levelling off the remaining heaps of silt ready for the next session. Between that Sunday and the sixteenth more rain saw the lake fill and empty three times, I thought this would have brought more silt in but there was an even larger area of the bottom clear so it would appear the continual changeing of the water is scrubbing up the silt. I am aware you want to get back to sailing but if the weather stays good a few more sessions should see the lake virtually clear of silt and weed, then the lake can be filled and the barley straw added and sailing begin. Also at present the car park is waterlogged so cannot really be used. As you will all be aware we have again suffered some of the worst flooding at Wicksteed Park since 1998, large areas of the Park are under water and things can only get worse in the short term in the lake areas. As part of a plan to avoid long term damage to the soil structure around the lake and river areas we have been asked to help out by removing the main overflow pipe so that when the water in the main lake drops our lake will empty and act as a form of holding tank allowing the water from the surrounding higher ground to enter our lake faster, collect and then discharge into the main lake. To these ends Nigel M. Dennis H and myself have spent best part of today at the lake. With the height of the water lapping the underside of the benches getting the overflow pipe out was no mean feat, the water at it's deepest being around 5' deep. Our lake is now joined to the main one and as of this morning water was flowing into our lake from the land drains, over the surface from the surrounding high ground and from the main lake so we have no shortage of water for those of us with deep keels. There is also a lot of debris coming into our lake so we intend to leave the overflow pipe out in the short term as, once the flooding has subsided and we get back to normal we may well need to give the lake an early spring clean, WP have also said that if we can leave the lake empty they will be able to repair the spot damage to the concrete pathway around the lake and any cracks that are in the lake wall. We were also asked to empty the store room of all the Boat Club equipment as they intend to remove the cast iron and steel filtration equipment to be sold as scrap as all the metal is of the highest quality and this will hopefully add to the Parks funds. Almost all of the rubbish can be recycled and items we need to keep including the barrows are temporally stored in the Gents toilets. As this toilet block is closed for the winter period access will only be available by getting the key from Security. Once the store/pump-room is empty we will be able to sneak back in again. I should add that the toilet block and pump-room were also flooded but fortunately all our stuff was undamaged. There are plans to install new land drainage systems in the areas surrounding our Lake and there are also plans to improve the sluices tied to the Lottery Grant so in the medium to long term the future of the Club water is bright. We also spent some time clearing debris from the top of the sluice gates which allowed more water to exit the main lake though more debris would have built up throughout the day, every little helps. Obviously sailing is now suspended for the next few weeks as nature takes it's course and the lake manager will through Maureen let you all know what's happening. He will of course be organising working parties as and when it's safe to do so to ensure we continue to have one of the best sailing waters in the area again next year. Pictures taken by Dennis Hubble.